I have to confess, before I moved to Japan I was a ramen barbarian. I use to think that all those ramen junk food was just that, unappetising noodles in soup. This is to no small part because when I used to starve, a “snack” was a pack of “shin ramen” instant noodles. Boiled quickly and tasty for a snack, but ultimately lacking in any real taste. That all changed when I arrived in Japan. Since then I have developed a love for ramen. I learnt about the different soup bases, the toppings, the regional specialties and joined the gentlemen’s ramen club at work (we have our own secret handkerchiefs to identify each other). But everywhere I went, I only seemed to hear one name. So one day I went to find out what all the fuss was about. 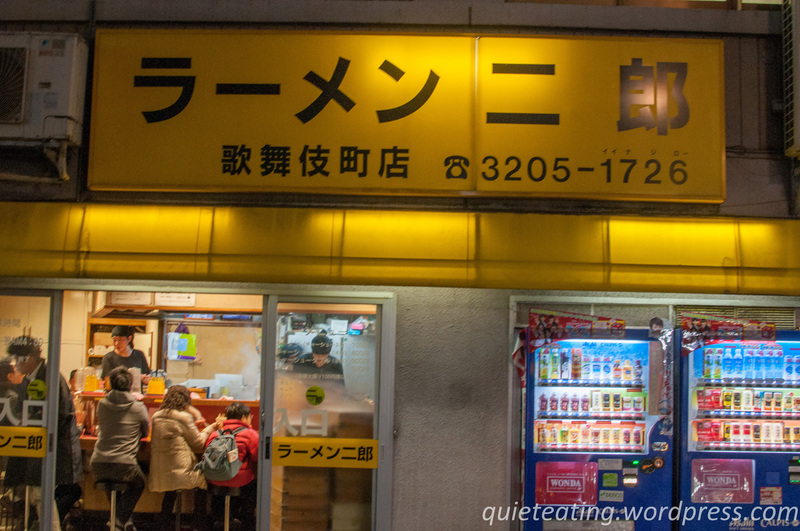 This is the outside of Ramen Jiro. Well one of the branches at least. It originally started at Mita, outside Keio university. And it was really popular with the students which I elaborate further below. 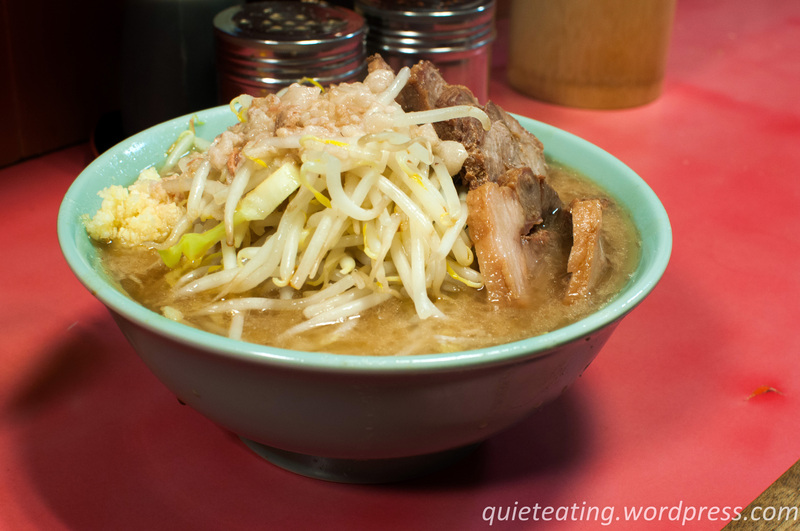 Ramen Jiro is known for its tonkotsu (pork) base ramen. It is also known for being extremely rich in taste and very cheap. When you arrive you choose your base, i.e. roast pork or plain. Then, once you sit down at the counter you get to add your toppings. These includes hot soy sauce (ok not too special), beansprouts, garlic or more fat. Well it makes it tastes better. 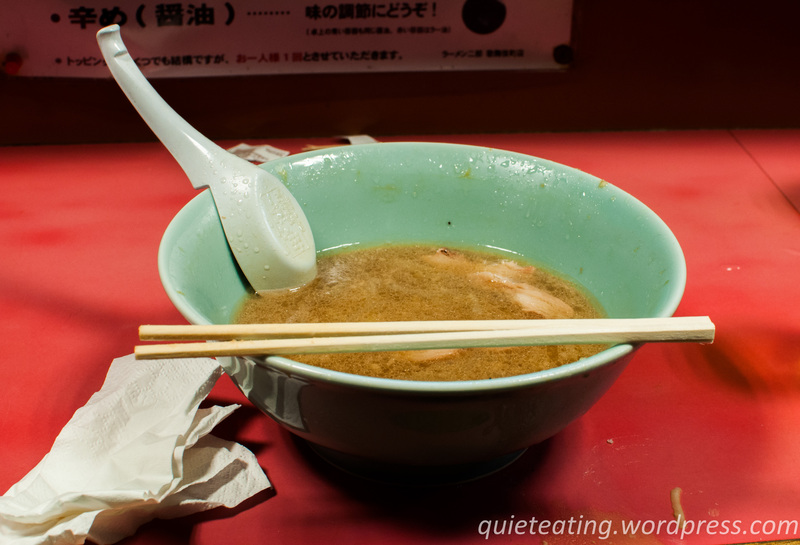 There is a also a special secret language at Ramen Jiro. You can ask for mashi mashi dai dabulu = the most humongous bowl of ramen you will ever see. Let me explain. This bowl is already twice the size of a normal ramen serving. It has 8 huge pieces of roast pork. It has fat on top. It has garlic on the side. Thick noodles soaking up the juice. All in a soup base that is only a few degrees away from being a solid. I even spilt some of the soup on the table and within 2 minutes it hard turned solid. Hmmm. So that’s what is going into my arteries. Strong men weep when mashi mashi dai dabulu is mentioned. You are treated as a hero if you finish it. But I still finished my bowl. Now with this serious value for money (JPY 900) Jiro is a favourite of students. Seems like half of my colleagues at work love it. But not me. After eating Jiro, I was in pain. So it goes down ok.
What they don’t tell you is that the noodles don’t stop growing once you eat them. They get bigger in your stomach. Kind of like Alien when something tries to burrow out of your tummy. So how was it? It was tasty, but maybe too tasty. My ramen snob friend who was eating with me described it as lacking real “taste” and I am inclined to agree. The richness overpowered everything. The roast pork was ok, but going for quantity rather than quality. I guess it doesn’t help when you ask for extra fat on top, but sometimes you have to go with the full experience. Although if I had to pick one thing to eat before fasting this would be it. I think there are 5000 calories in a bowl. This scores a 5/10 quieteating rating. Although in my student days this would probably push up to a 6.5/10 due to purse constraints.